Tirupati Balaji - Balaji is a name for the Hindu God Venkateswara, a form of Vishnu. The name Venkateswara stems from the Indian language of Sanskrit where Vem translates to Sin, ""Kata translates to destruction, and Ishwara translates to Supreme Lord. The form is more popular in Southern India. This brass sculpture is an attempt by the artist to praise the Lord and giving a chance to bring him home. The artistic nature and undeniable glory of these Statue will uplift the overall beauty of your home & temple. This beautiful item is sure to increase the purity of the atmosphere by its presence. Thus it can be used as a home decor item or it can also be worshiped daily. Present this beautiful Small Balaji idol to your loved one on any auspicious occasion to make them feel special. Buy Brass Tirupati Balaji Venkateswara Statue No. 2 - 4.5", sold & shipped by Little India where you can shop online for Traditional Indian Gifts, Handicraft, Decor, Mandir & Murti. 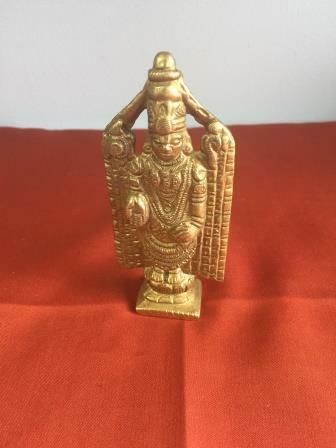 This Idols & Statues collection has been tagged as Puja, God, Balaji, Tirupati, Tirupati Balaji, hindu religion, Religious gift Worship, Devotion.